Sitting at the centre of French culture outside of France due to its status as the economic centre of Quebec and the fact that it is the largest French metropolis in the world apart from the mother country, Montreal is a world away culturally from the rest of Canada. This urban paradise has attracted visitors from across Canada, the United States and from around the world for many years, due to its remarkable food culture, award-winning performing arts facilities, festivals, and its extensive back history means that there is potential for an endless amount of activity and fun during your time in Montreal. Of course, the problem with this is that when you have a city bursting with so many marquee attractions that are all crying out for attention at once, picking where to start can be an exercise in frustration. So don’t stress yourself out on this count – we’ve got you covered. Go ahead and focus on checking into a hotel in old port of Montreal and open up your laptop again when you’ve gotten settled in your room. When you are, continue reading below about the five things in Montreal that you should not miss under any circumstances. If you get these things to do in Montreal done, you can consider your trip there a success. It’s truly a city between Europe and the USA, and you don’t have to apply for an ESTA visa either. Being situated at the head of the historical end of the navigable portion of the St. Lawrence River, a missionary named Ville Marie successfully established a trading post on an island that sat in its midst, just before the river descended into rapids. More than 350 years later, Montreal is a thriving world city, filled with buildings of all ages. The greatest concentration of the oldest surviving buildings can be found in Old Montreal, a section of the city where some structures date all the way back to the 1600’s. Many throughfares here are cobblestoned, museums can be found everywhere, and street performers proliferate here in the summer time. 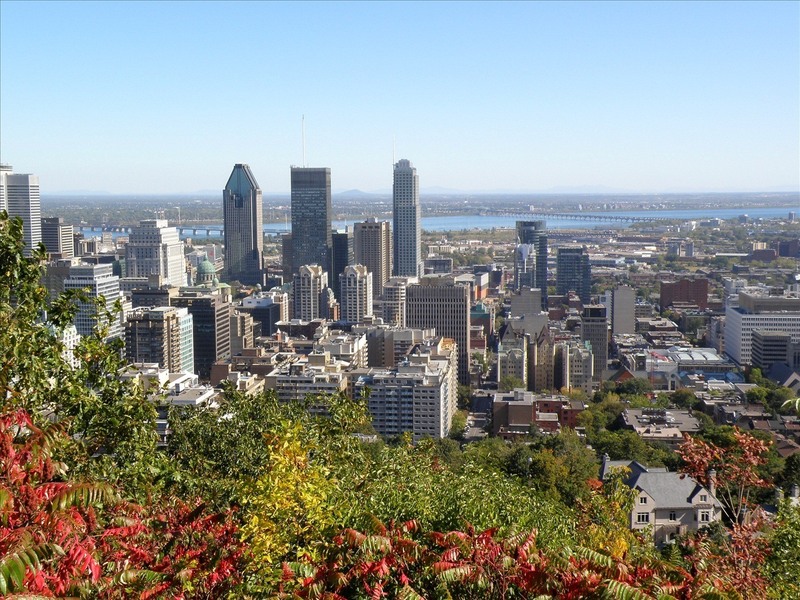 Though it is more of a big hill than a mountain, Mont Royal is more famous in Montreal for being a favored gathering place for city residents from all walks of life. Summer time sees sun worshipers soaking up the rays on its expansive lawns, playing catch, or drumming/playing guitar under the smoldering hot sun. The views of downtown are classic from here, so make sure your camera is properly charged and prepare to get some excellent photos. Back in 1967, Montreal hosted the World’s Fair on the appropriate occasion of Canada’s centennial birthday. While most of the facilities that resulted from this event were taken down long ago, several remain, and are seamless aspects of Montreal’s urban landscape. The Biosphere, a giant geodesic dome, now hosts a museum run by Environment Canada that are dedicated to the many important environmental issues of the present day. Habitat 67 continues as a housing development, despite its anarchic shape. La Ronde is still a popular amusement park, and the metro continues to provide access to far flung places all over the metropolitan area. Ever since Prohibition in the United States during the 1920’s drove people from there to Montreal to enjoy their favourite vice on vacation, Montreal has been a popular destination for those from away that have sought an active nightlife. Montreal is perhaps the most gay friendly place in all of North America, if not the world, as many bars catering to every subgenre of LGBT can be found on Ste Catherine’s Street East. For those seeking something more mainstream, dance clubs and various other sports bars can be found on Blvd St. Laurent and Rue Crescent, among other spots throughout the downtown core. While poutine can be found everywhere here (and you should try some), there is so much more to Montreal’s culinary scene then this french fry and cheese curd with gravy dish. Smoked meat sandwiches at Schwartz’s Deli, Montreal style bagels at St-Viateur’s, split-pea soup, toutiere, and all-dressed pizza should all be on your chowhound hit list. Additionally, outstanding restaurateurs serving cuisine that pushes the edges of what’s conventional can be found everywhere in this city that is filled with creatives, leading to finds with almost every other meal that you will have here! Do you want to copy posts from other blogs rewrite them in seconds and post on your site or use for contextual backlinks?